Leading a double life in Amsterdam | What Hi-Fi? Some hi-fi manufacturers lead double lives, and the Integrated Systems Europe (ISE) show is the easiest way for someone like me (whose big preoccupation is, of course, consumer electronics) to get an idea of what these companies are getting up to when my back is turned. Of course the idea that technology/hi-fi/electronics companies might have more irons in the fire than just the product ranges they deliver to What Hi-Fi? Sound and Vision isn’t entirely staggering. Take Tannoy, for instance. Everybody knows the firm has quite a pedigree in professional audio equipment (it’s not every brand name that finds its way into the dictionary, after all) but it’s only once you’re in the Amsterdam RAI throng and navigating ISE’s 950-plus exhibitors that the scale of operations on the pro-video and pro-audio side becomes apparent. And naturally it’s not just Tannoy. Bowers & Wilkins and KEF (to pick a couple of other venerable British brands at not-quite random) both have operations that extend far beyond consumer electronics – although the CE stuff takes up a decent amount of space on their stands. KEF and B&W are both making giant strides in the world of custom installation, and are using ISE to showcase their extensive ranges of in-wall, in-ceiling, inside-rockery loudspeakers. Monitor Audio, too, can help you out if you’re a) lucky enough to be able to specify a listening room or home cinema space or b) in need of some weatherproof speakers for your yacht. Away from loudspeakers there are other, equally globe-straddlingly famous, brands that have a whole other raison d'etre here in Amsterdam that ordinarily I would not even get a hint of. Samsung and LG, for instance, are duking it out to see who can offer the biggest, brightest, highest-resolution video displays, digital signage and other cutting-edge pro-video equipment (and they're also offering the likes of me the chance to get much closer to their brand-new state-of-the-art TVs and so on than I was able to at CES in Las Vegas last month). Sennheiser not only has its colossal range of headphones here but also an absolute stack of comms equipment, from call-centre headsets to hugely elaborate video-conferencing hardware. And the list goes on, from the folks you might reasonably be expected to have heard of (Canon, Mitsubishi, Panasonic, Sony, Yamaha) to those you most certainly have not (Adder? Airgoo? Avnet? And that's just among the A's). They're all here and they all have a solution to problems those of us who deal exclusively in consumer electronics may not have even realised existed. 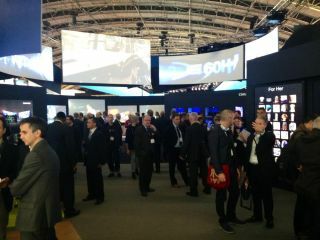 But it's the convergence of professional, installation and consumer products that's made ISE such a success. The first show, in Geneva in 2004, featured 120 exhibitors and hosted 3500-ish attendees, while this year’s show is projected to see more than 50,000 people through the door. And while I’m bound to see the consumer electronics as the state of the art (it’s Formula One, whereas pro-audio is a go-anyhwere, survive-any-maltreatment sort of armour-plated 4x4), a show like ISE is invaluable for putting things in context. And for seeing seven-metre tall projections of Beyonce.